This document describes "regular" VCF files produced for GERMLINE short variant (SNP and indel) calls (e.g. by HaplotypeCaller in "normal" mode and by GenotypeGVCFs). For information on the special kind of VCF called GVCF produced by HaplotypeCaller in -ERC GVCF mode, please see the GVCF entry. For information specific to SOMATIC calls, see the Mutect2 documentation. VCF stands for Variant Call Format. It is a standardized text file format for representing SNP, indel, and structural variation calls. The VCF specification used to be maintained by the 1000 Genomes Project, but its management and further development has been taken over by the Genomic Data Toolkit team of the Global Alliance for Genomics and Health. The full format spec can be found in the Samtools/Hts-specs repository along with other useful specifications like SAM/BAM/CRAM. We highly encourage you to take a look at those documents, as they contain a lot of useful information that we don't go over in this document. After the header lines and the field names, each line represents a single variant, with various properties of that variant represented in the columns. Note that all the lines shown in the example above describe SNPs and indels, but other variation types could be described (see the VCF specification for details). 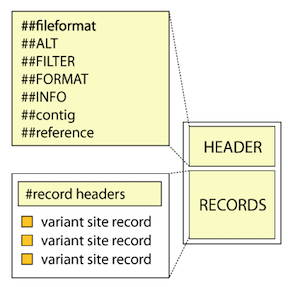 Depending on how the callset was generated, there may only be records for sites where a variant was identified, or there may also be "invariant" records, ie records for sites where no variation was identified. The following is a valid VCF header produced by GenotypeGVCFs on an example data set (derived from our favorite test sample, NA12878). You can download similar test data from our resource bundle and try looking at it yourself. That's a lot of lines, so let's break it down into digestible bits. Note that the header lines are always listed in alphabetical order. 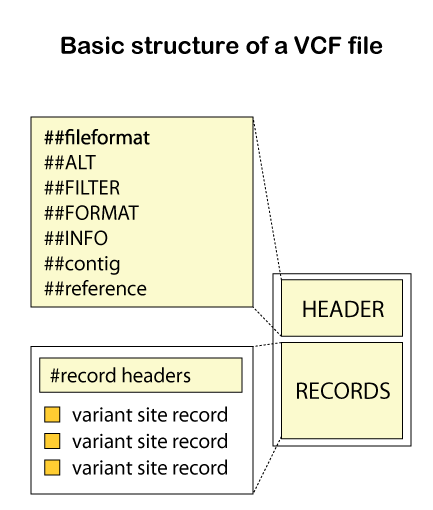 These lines define the annotations contained in the FORMAT and INFO columns of the VCF file, which we explain further below. If you ever need to know what an annotation stands for, you can always check the VCF header for a brief explanation (at least if you're using a civilized program that writes definition lines to the header). The GATKCommandLine lines contain all the parameters that went used by the tool that generated the file. Here, GATKCommandLine.HaplotypeCaller refers to a command line invoking HaplotypeCaller. These parameters include all the arguments that the tool accepts, along with the values that were applied (if you don't pass one, a default is applied); so it's not just the arguments specified explicitly by the user in the command line. These contain the contig names, lengths, and which reference assembly was used with the input BAM file. This can come in handy when someone gives you a callset but doesn't tell you which reference it was derived from -- remember that for many organisms, there are multiple reference assemblies, and you should always make sure to use the appropriate one! For more information on genome references, see the corresponding Dictionary entry. The contig and genomic coordinates on which the variant occurs. Note that for deletions the position given is actually the base preceding the event. An optional identifier for the variant. Based on the contig and position of the call and whether a record exists at this site in a reference database such as dbSNP. A typical identifier is the dbSNP ID, which in human data would look like rs28548431, for example. The Phred-scaled probability that a REF/ALT polymorphism exists at this site given sequencing data. Because the Phred scale is -10 * log(1-p), a value of 10 indicates a 1 in 10 chance of error, while a 100 indicates a 1 in 10^10 chance (see the Dictionary entry). These values can grow very large when a large amount of data is used for variant calling, so QUAL is not often a very useful property for evaluating the quality of a variant call. See our documentation on filtering variants for more information on this topic. This field contains the name(s) of any filter(s) that the variant fails to pass, or the value PASS if the variant passed all filters. If the FILTER value is ., then no filtering has been applied to the records. It is extremely important to apply appropriate filters before using a variant callset in downstream analysis. See our documentation on filtering variants for more information on this topic. Various site-level annotations. This field is not required to be present in the VCF. The annotations contained in the INFO field are represented as tag-value pairs, where the tag and value are separated by an equal sign, ie =, and pairs are separated by colons, ie ; as in this example: MQ=99.00;MQ0=0;QD=17.94. They typically summarize context information from the samples, but can also include information from other sources (e.g. population frequencies from a database resource). Some are annotated by default by the GATK tools that produce the callset, and some can be added on request. They are always defined in the VCF header, so that's an easy way to check what an annotation means if you don't recognize it. You can also find additional information on how they are calculated and how they should be interpreted in the "Annotations" section of the Tool Documentation. In the three sites shown in the example above, NA12878 is observed with the allele combinations T/G, A/A and AAGGCT/AAGGCT respectively. For non-diploids, the same pattern applies; in the haploid case there will be just a single value in GT (e.g. 1); for polyploids there will be more, e.g. 4 values for a tetraploid organism (e.g. 0/0/1/1). Allele depth (AD) and depth of coverage (DP). These are complementary fields that represent two important ways of thinking about the depth of the data for this sample at this site. "Normalized" Phred-scaled likelihoods of the possible genotypes. For the typical case of a monomorphic site (where there is only one ALT allele) in a diploid organism, the PL field will contain three numbers, corresponding to the three possible genotypes (0/0, 0/1, and 1/1). The PL values are "normalized" so that the PL of the most likely genotype (assigned in the GT field) is 0 in the Phred scale. We use "normalized" in quotes because these are not probabilities. We set the most likely genotype PL to 0 for easy reading purpose.The other values are scaled relative to this most likely genotype. At this site, the called genotype is GT = 0/1, which corresponds to a heterozygous genotype with alleles T/G. The confidence indicated by GQ = 99 is very good; there were a total of 33 informative reads at this site (DP=33), 18 of which supported the REF allele (=had the reference base) and 15 of which supported the ALT allele (=had the alternate base) (indicated by AD=18,15). The degree of certainty in our genotype is evident in the PL field, where PL(0/1) = 0 (the normalized value that corresponds to a likelihood of 1.0) as is always the case for the assigned allele; the next PL is PL(0/0) = 393, corresponding to 10^(-39.3), or 5.0118723e-40 which is a very small number indeed; and the next one will be even smaller. The GQ ends up being 99 because of the capping as explained above. Here we have an indel -- specifically an insertion of TT after the reference C base at position 10024300. The called genotype is GT = 0/1 again, but this time the GQ = 20 indicates that even though this is probably a real variant (the QUAL is not too bad), we're not sure we have the right genotype. Looking at the coverage annotations, we see we only had 6 reads there, of which 1 supported REF and 4 supported ALT (and one read must have been considered uninformative, possibly due to quality issues). With so little coverage, we can't be sure that the genotype shouldn't in fact be homozygous variant. This site is a doozy; two credible ALT alleles were observed, but the REF allele was not -- so technically this is a biallelic site in our sample, but will be considered multiallelic because there are more than two alleles notated in the record. It's also a mixed-type record, since one of the ALTs by itself would make it an A->G SNP, and the other would make it an insertion of GGGAGG after the reference A. The called genotype is GT = 1/2, which means it's a heterozygous genotype composed of two different ALT alleles. The coverage wasn't great, and wasn't all that balanced between the two ALTs (since one was supported by 11 reads and the other by 5) but it was sufficient for the program to have high confidence in its call. These are a few common things you may want to do with your VCFs that don't deserve their own tutorial. Let us know if there are other operations you think we should cover here. By that I mean check that the format of the file is correct, follows the specification, and will therefore not break any well-behave tool you choose to run on it. 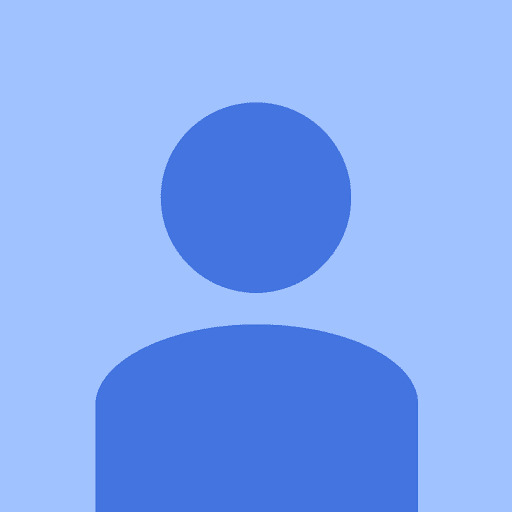 You can do this very simply with ValidateVariants. Note that ValidateVariants can also be used on GVCFs if you use the --gvcf argument. Sometimes you want to subset just one or a few samples from a big cohort. Sometimes you want to subset to just a genomic region. Sometimes you want to do both at the same time! Well, the same tool can do both, and more; it's called SelectVariants and has a lot of options for doing this like that (including operating over intervals in the usual way). There are many options for setting the selection criteria, depending on what you want to achieve. For example, given a single VCF file, one or more samples can be extracted from the file, based either on a complete sample name, or on a pattern match. Variants can also be selected based on annotated properties, such as depth of coverage or allele frequency. This is done using JEXL expressions. Other VCF files can also be used to modify the selection based on concordance or discordance between different callsets (see --discordance / --concordance arguments in the Tool Doc. In the output VCF, some annotations such as AN (number of alleles), AC (allele count), AF (allele frequency), and DP (depth of coverage) are recalculated as appropriate to accurately reflect the composition of the subset callset. By default, SelectVariants will keep all ALT alleles, even if they are no longer supported by any samples after subsetting. This is the correct behavior, as reducing samples down shouldn't change the character of the site, only the AC in the subpopulation. In some cases this will produce monomorphic records, i.e. where no ALT alleles are supported. The tool accepts flags that exclude unsupported alleles and/or monomorphic records from the output. Seriously. The VCF format lends itself really poorly to parsing methods like regular expressions, and we hear sob stories all the time from perfectly competent people whose home-brewed parser broke because it couldn't handle a more esoteric feature of the format. We know we broke a bunch of people's scripts when we introduced a new representation for spanning deletions in multisample callsets. OK, we ended up replacing it with a better representation a month later that was a lot less disruptive and more in line with the spirit of the specification -- but the point is, that first version was technically legal according to the 4.2 spec, and that sort of thing can happen at any time. So yes, the VCF is a difficult format to work with, and one way to deal with that safely is to not home-brew parsers. There are three main reasons why you might want to combine variants from different files into one, and the tool to use depends on what you are trying to achieve. The most common case is when you have been parallelizing your variant calling analyses, e.g. running HaplotypeCaller per-chromosome, producing separate VCF files (or GVCF files) per-chromosome. For that case, you can use the Picard tool MergeVcfs to merge the files. See the relevant Tool Doc page for usage details. The second case is when you have been using HaplotypeCaller in -ERC GVCF or -ERC BP_RESOLUTION to call variants on a large cohort, producing many GVCF files. You then need to consolidate them before joint-calling variants with GenotypeGVCFs (for performance reasons). This can be done with either CombineGVCFs or ImportGenomicsDB tools, both of which are specifically designed to handle GVCFs in this way. See the relevant Tool Doc pages for usage details and the Best Practices workflow documentation to learn more about the logic of this workflow. The third case is when you want to compare variant calls that were produced from the same samples but using different methods, for comparison. For example, if you're evaluating variant calls produced by different variant callers, different workflows, or the same but using different parameters. For this case, we recommend taking a different approach; rather than merging the VCF files (which can have all sorts of complicated consequences), you can us the VariantAnnotator tool to annotate one of the VCFs with the other treated as a resource. See the relevant Tool Doc page for usage details. There is actually one more reason why you might want to combine variants from different files into one, but we do not recommend doing it: you have produced variant calls from various samples separately, and want to combine them for analysis. This is how people used to do variant analysis on large numbers of samples, but we don't recommend proceeding this way because that workflow suffers from serious methodological flaws. Instead, you should follow our recommendations as laid out in the Best Practices documentation. I have a quick question. You have underscores in names in the 'FORMAT' column. According to the 4.2 VCF format spec (https://samtools.github.io/hts-specs/VCFv4.2.pdf) these should be colon separated alpha-numeric lists: "First a FORMAT field is given specifying the data types and order (colon-separated alphanumeric String)." Do you have any plans to change this? Or do you use some alternate spec that is available somewhere else? I would like to be able to validate file format when required (e.g. with the EBI validator)? Does the VCF not validate with EBI Validator? I think the VCFs produced by our tools should/do follow the VCF spec. The VCF does not pass the EBI validator. I posted the error they give above. The reason this violates the format is because in "1.4.2 Genotype fields" of the 4.2 VCF they explain that "First a FORMAT field is given specifying the data types and order (colon-separated alphanumeric String)." Underscores aren't included in an alphanumeric string. Obviously not a major issue. However, having VCF files that can pass validation can be required for some uploads and ideally our output would be valid and unchanged from the Mutect2 raw output. Thanks for the information. Let me see what the developers say and get back to you.